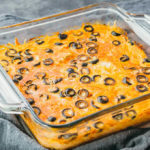 This easy casserole recipe has all of the flavors of traditional Mexican chile rellenos, but skips the breading and frying. It's healthy, low carb, keto, and vegetarian. Preheat the oven to 350 F. Prepare a greased 8x8 inch baking dish. Drain the chile and olive cans. Slice each chile open lengthwise, and pat dry with paper towels. Lay half of the chiles along the bottom of the baking dish. Distribute half of each cheese on top. In a bowl, beat eggs and enchilada sauce until well-mixed. Evenly pour about half of the sauce over the cheese in the baking dish. Lay remaining chiles on top of the sauce. Distribute remaing cheese. Scatter the olives on top. Evenly pour remaining sauce on top. Bake uncovered at 350 F until the surface is set and the casserole is cooked through, about 40 minutes. Let it rest for 10 minutes before slicing. This recipe yields 6 g net carbs per serving (quarter of an 8x8-inch casserole or 1/4 of the recipe).